Simon Jones Murphy, born in Windsor, Maine in 1815, earned a fortune in the lumber industry there. In the 1860s, he realized that much of the best timber in the Pine Tree State had been cut and that his financial interests would be enhanced if he migrated to a state with tremendous reserves of pine trees. He had mastered the techniques of getting rich from lumber. In 1866, he moved to Detroit and, for about three decades, he and his partners purchased several hundred thousand acres of Michigan’s finest pine lands, cut the timber and shipped it to market. By the early 1890s, the most desirable pine forests in this state had been cut. The financial Panic of 1892 also temporarily dampened the profits that might be made in Michigan’s once great but then declining timber industry. Perhaps after Michigan’s timber industry passed its apogee, Simon Murphy turned his interest from the rural to the urban. He realized that there was a need for office and manufacturing space in downtown Detroit. 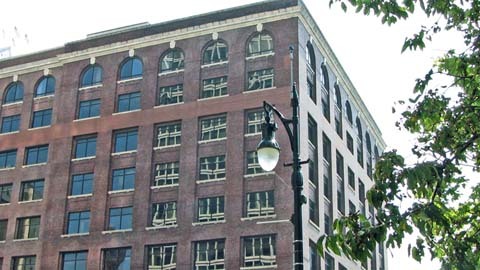 The first building he erected was the Murphy Power Building on West Congress, a building designed to provide electrical and steam power to small manufacturers who would rent space there in downtown Detroit. Cigar manufacturers were among the first to rent space in that building. Printers came later. Alas, Simon Murphy died at age 90 in 1910, just a few months before the Murphy Power Building opened for business. His son, Charles Murphy, took over Simon Murphy’s extensive efforts to profit from developing buildings in downtown Detroit. Before his death, Simon Murphy had invested in the development of the first of the three Penobscot Buildings that still offer office space to Detroit professionals. 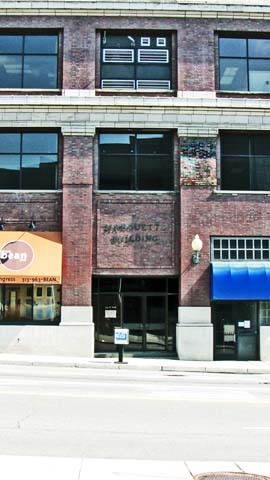 He had also invested in the Marquette Building shown above. 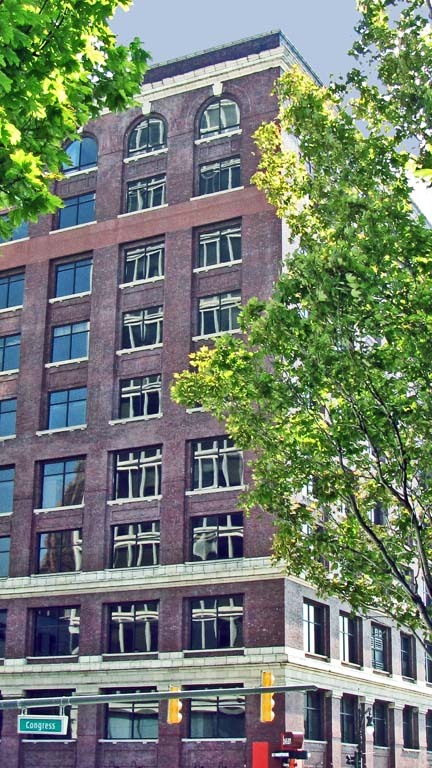 Although, it does not resemble the Murphy Power Building, it was designed for a similar purpose—to provide rental space for small manufacturing firms in the era just before the dawn of the vehicle age. Charles Murphy took over his father’s real estate business, completed the three buildings that were under construction at his death—the Murphy Power Building, the first Penobscot Building and the Marquette Building—and then went on to build two more Penobscot Buildings that are components of the three-building complex that now bears that name. Simon Murphy selected the name Penobscot to honor either the major river in Maine that carries that name or the Penobscot Indians who also lived in his native Maine. This building—along with the Murphy Power Building—was restored by the 400 Monroe Associates, an architectural and development firm devoted to renovating classic buildings in downtown Detroit for commercial purposes. This building is one of many locations in Michigan named for Jacques Marquette. Born in Laon, France on June 10, 1637, he joined the Society of Jesus in 1654 and became a priest, hence the name Pere Marquette. After teaching in France for some years, he was assigned to Québec in 1666 and devoted himself to learning the languages of the Indians, especially the Huron tongue which is in the Iroquoian language family. In 1668, he was assigned to minister to Indians in the Upper Great Lakes. He established a mission at Sault Ste. Marie in 1668. Three years later, Pere Marquette founded St. Ignace at the Straits of Mackinac giving it a name to honor the Spanish priest, Ignatius of Loyola, who found the Jesuit order of priests. Thus, Marquette played a key role in founding the first European settlements in Michigan. Actually, there were probably French traders with French-Indian children living in both Sault Ste. Marie and St. Ignace by the time Pere Marquette arrived. French traders probably operated from Sault Ste. Marie as early as 1641 and French Jesuits visited the Lake Superior area to preach to the Indians and to the growing mixed race French-Indian population. Pere Marquette established his missions giving these locations a status as a French settlement in the remote wilderness. Marquette heard about a major river and wished to explore it. This turned out to be the Mississippi. On May 17, 1673, Pere Marquette, the explorer Louis Jolliet, and a group of French-Indian voyageurs set out to explore what we now think of as the Midwest and the Mississippi River Valley. They sailed across Lake Michigan to Green Bay and then up the Fox River as far as possible. The portaged to the river they sought reaching it as present day Prairie du Chien, Wisconsin. Then they sailed down the Mississippi toward the Gulf of Mexico getting as far as the point where the Arkansas River joins the Mississippi. At that confluence, they found that the local Indians had Spanish goods. They assumed that the Spanish were nearby and that they might be set upon by the Spanish military who would assume there were trying to claim the territory for France. Rather than risk their safety, Pere Marquette and his colleagues turned around and went north on the Mississippi. They learned of the Illinois River and sailed on it toward present-day Chicago, greatly reducing the distance of their return trip. I believe that they got back to St. Ignace by the autumn of 1673. That was quite a long trip in the summer of that year. Pere Marquette traveled to Illinois in 1674 and again in 1675. By that time, he suffered from dysentery and, on his return trip to St. Ignace; he died at a site close to present-day Ludington. That location had the name Pere Marquette for a long time and a large cross and historical marker designate the place where he died. However, the industrialist James Ludington initiated a large-scale lumbering operation in this area and, in about 1864, the settlement’s name was changed from Pere Marquette to its present name, Ludington. I wonder if local historians and promoters in Ludington have considered returning the name of their city to Pere Marquette. Real estate speculators have had this building in play for a number of years. I believe there were plans to tear this structure down in the late 1970s or early 1980s. Apparently, a local firm purchased the structure and saved it for the wrecking ball. In late 2014, the Mexican billionaire, Carlos Sim who has been ranked at times as the richest person in thr world, purchase the Marquette Building for $5.8 million. National Register of Historic Places: The Marquette Building is within the Detroit Financial District which was listed as a National Historic District on December 14, 2009.